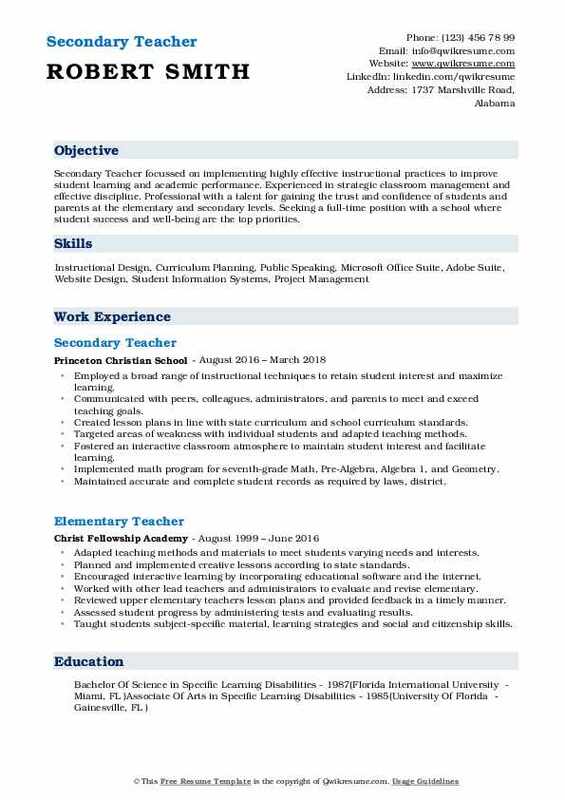 The job description of a Secondary Teacher is to instruct and educate secondary grade students in one or more than one subjects such as English, Language, Mathematics, Social Studies, or General Science. 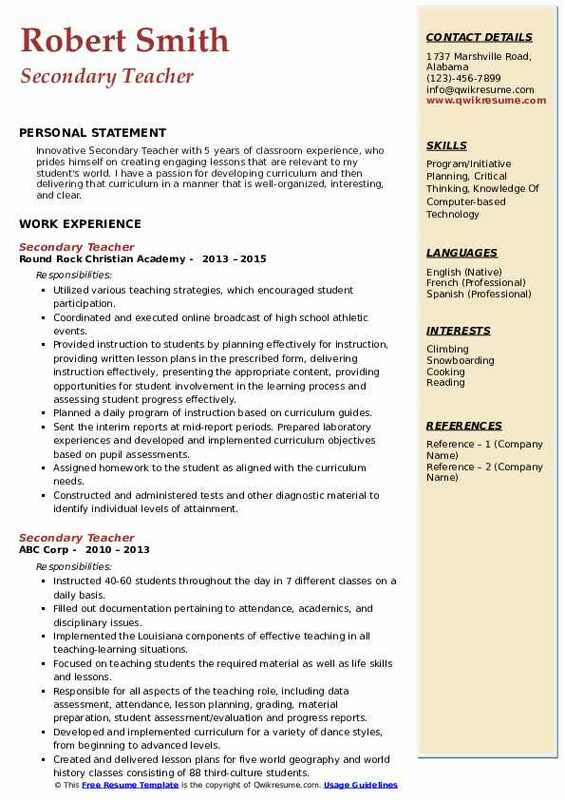 Primary responsibilities included on the Secondary Teacher Resume are – instructing secondary school students, creating instructional resources, planning and delivering instructional activities, maintaining grade books, creating lesson plans, preparing students for internal and external examinations, supervising and assisting teaching assistants, and managing student behavior. Managing 11 to 16 age group students requires a blend of soft and specific skills such as – the ability to build a strong relationship, having strong knowledge of the subject they are teaching, a sense of humor, the capacity to learn quickly, resourcefulness, caring nature and the ability to keep things in perspective. The minimum level of qualification is a Master’s degree in any specialized subject and a Degree in Education as well. Summary : Secondary Instructor with experience in pedagogy, grant and curriculum writing. Extensive administrative support experience in an institution of higher education. Excelled in classroom instruction, administrative support to operations and management, and administrative office processes and procedures. Core Qualifications are Strong business instruction experience at the high school level. Knowledge of business management and research practices and principles. Experience teaching STC dual enrollment continuing education courses. Experience teaching MOS (Microsoft Office Specialist) certification courses: MS Word, Excel, Access, Powerpoint, Publisher. Extensive training in pedagogical practices such as rigor relevance strategies, and interactive classroom techniques. Prepared lesson plans and course base assessments for business information management (bim) course and principles of arts, audio video technology and communications (paavtc) course. Prepared lessons that reflected accommodations for individual student abilities. Presented subject matter according to guidelines established by Texas Educations Agency (TEA), school board policies, administrative regulations, and the individual education plan (IEP). Conducted assessment of student learning styles and use results to plan instructional activities. Taught science form 5 (year 11), and biology form 7 (year 13) at Liahona high school. Conducted laboratory experiments and arranged field trips for both levels. Met with parents on a regular basis and discussed students progress in the classroom. Participated in planning a system approach to minimize students slacking classes. Visited with parents in their homes when needed for the student's success. Established positive repo with the parents and the school community. Delegated responsibilities and supervise large groups while maintaining a safety culture. Attended meetings for staff development or individual education planning. Created, prepared, and presented lessons and presentations to all group sizes. 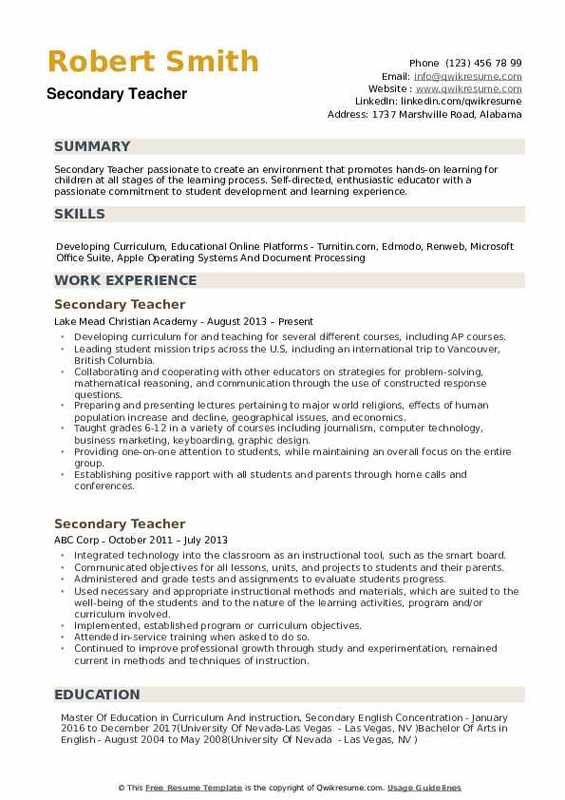 Summary : Service-oriented Secondary Teacher with over 13-year background in Public schools. Core competencies include ability to learn new tasks and routines, efficient critical reading and detail oriented as well as excellent communication and time management skills. Handles tasks with accuracy and efficiency. Extensive skills in professional forms design and presentation. Excellent written and oral communication skills. Established and enforced rules for behavior and procedures for maintaining order. Adapt teaching methods and instructional materials to meet students varying needs and interests. Prepared, administered, and graded tests and assignments to evaluate students progress. Established clear objectives for all lessons, units, and projects and communicate those objectives to students. Prepared the students for later grades by encouraging them to explore learning opportunities and to persevere with challenging tasks. Conferred with parents or guardians, other teachers, counselors, and administrators to resolve students behavioral and academic problems. Prepare the objectives and outlines for courses of study, following curriculum guidelines or requirements of states and schools. 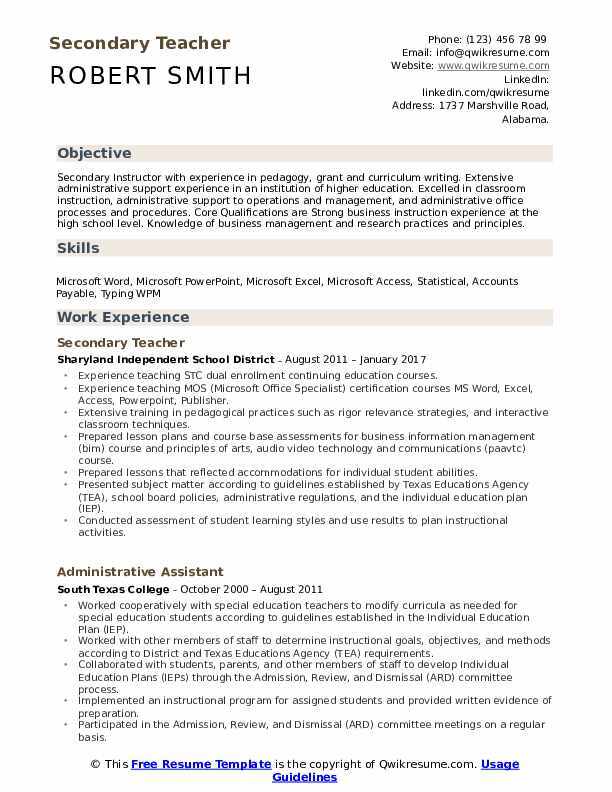 Objective : Secondary Teacher seeking new opportunities after 4 years of experience teaching high school students reading, writing, and critical thinking. Skilled working in high-pressure and fast-paced environments that require flexibility and adaptability. Enjoys classic literature, European and American history, pop culture, drawing, and film. Produced, redesigned, and implemented unique, relevant, rigorous, and engaging unit and lessons plans aligned with district curriculum to support and prepare students for Pre-AP and AP courses. Developed a new academic literacy program and curriculum with the English department to scaffold and support students who struggle passing STAAR (state assessment). Created activities to explore the relationship between critical reading and writing concepts in everyday life as well as cross-curricular connections to scaffold lessons across subject areas. Analyzed and maintained student records and assessment data to identify students’ needs, progress, and areas of growth. Worked with the 10th-grade English team, professional learning community, special education teachers, administrators, counselors, librarians, mentors, coaches, parents, and avid to collaborate on lesson plans, assess student progress, and ensure student success. Communicated with over 100 students and their parents via email, phone, google classroom, remind, and other platforms to build and maintain positive relationships. Mentored student and first-year teachers, modeling teaching, planning, and assessment strategies. Summary : Talented Secondary Teacher who empowers students with the tools they need to become ambassadors of knowledge and valuable members of society, highly responsive to the unique developmental needs of middle school-aged students. Implemented a variety of instructional strategies to improve student performance. Utilized web-based resources that included primary documents such as excerpts and political cartoons to enhance critical-thinking skills. Correlated Teks-based standards with classroom assessments to ensure student success on state exams. Analyzed local/state assessment data to identify standards that resulted in low student performance and developed intervention strategies to address low performing standards. Established classroom management procedures to promote a learning environment. Maintained accurate records such as student attendance and grades using an online system. Participated in educational-based training to improve teaching skills. Prepared students for the New York State ELA Regents examination and the PSAT. Summary : Secondary Teacher focussed on implementing highly effective instructional practices to improve student learning and academic performance. Experienced in strategic classroom management and effective discipline. Professional with a talent for gaining the trust and confidence of students and parents at the elementary and secondary levels. 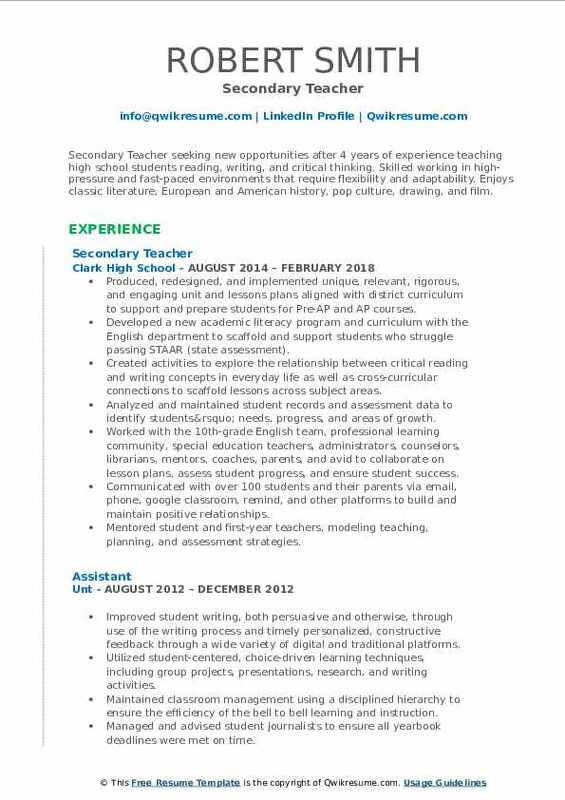 Seeking a full-time position with a school where student success and well-being are the top priorities. Communicated with peers, colleagues, administrators, and parents to meet and exceed teaching goals. Targeted areas of weakness with individual students and adapted teaching methods. Fostered an interactive classroom atmosphere to maintain student interest and facilitate learning. Implemented math program for seventh-grade Math, Pre-Algebra, Algebra 1, and Geometry. Maintained accurate and complete student records as required by laws, district. Developed, administered, and graded tests in order to evaluate students progress. Interacted with school administration for implementing appropriate class instruction. 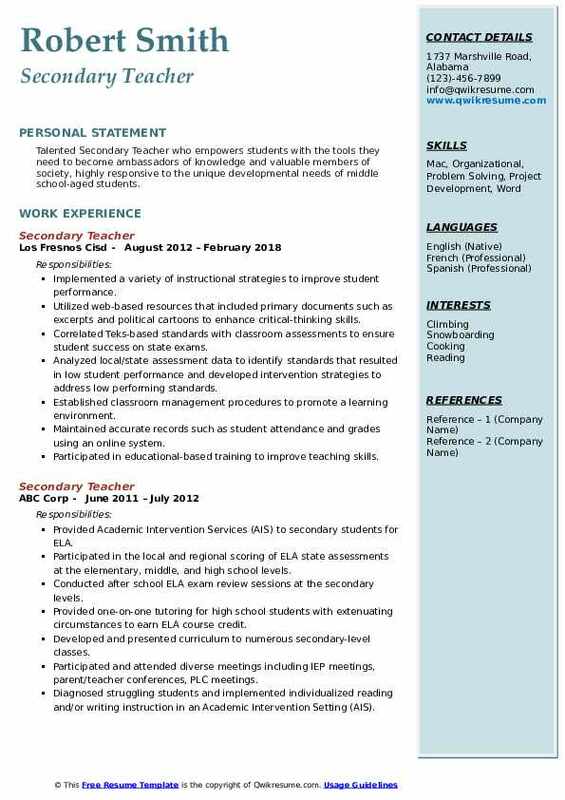 Summary : Dedicated, highly skilled Secondary Teacher with 18 years of quality experience as a high school social studies classroom teacher, seeking an opportunity to serve as an educational leader in a K-12 school. I am a highly adaptable and versatile educator seeking to enhance the literary and writing skills of future educators and corporate leaders. Instructed students in a variety of Social Studies courses including African, American History, Civics and Economics, World History, United States History, and Current Events and American Government to students in grades 9-12. Designed engaging lesson plans that were aligned with the standard course of study, and focused on age and level-appropriate material. Established and enforced procedures for maintaining a safe, effective learning environment for classes of ten to thirty-five students. Collaborated with colleagues within the department, school, and district to promote high levels of student achievement across all content. Received high remarks for the creativity of classroom lesson plans and instructional techniques from students, parents, and faculty. 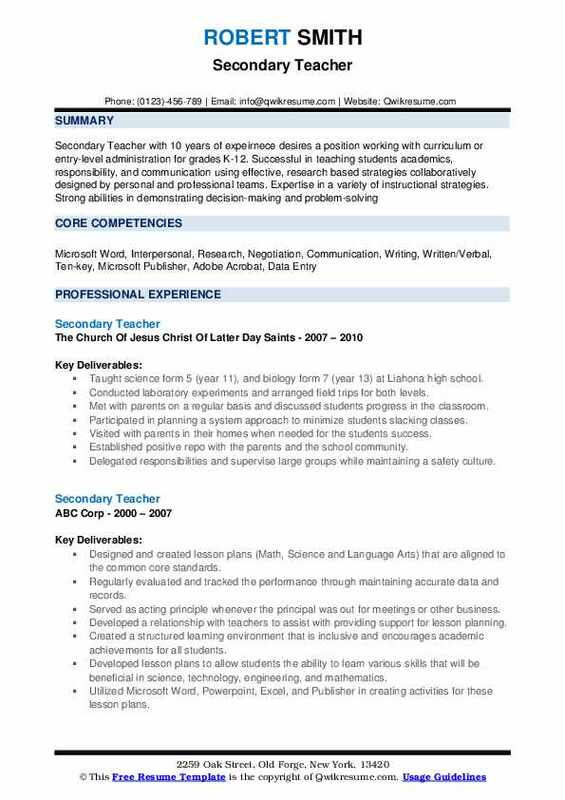 Served as a school site cooperating teacher for three student teachers from local universities, and internship advisor for numerous other college students interested in the profession. Communicated with parents pertaining to students academics, behavior, expectations, and parent-teacher cooperation in the motivation of students learning. 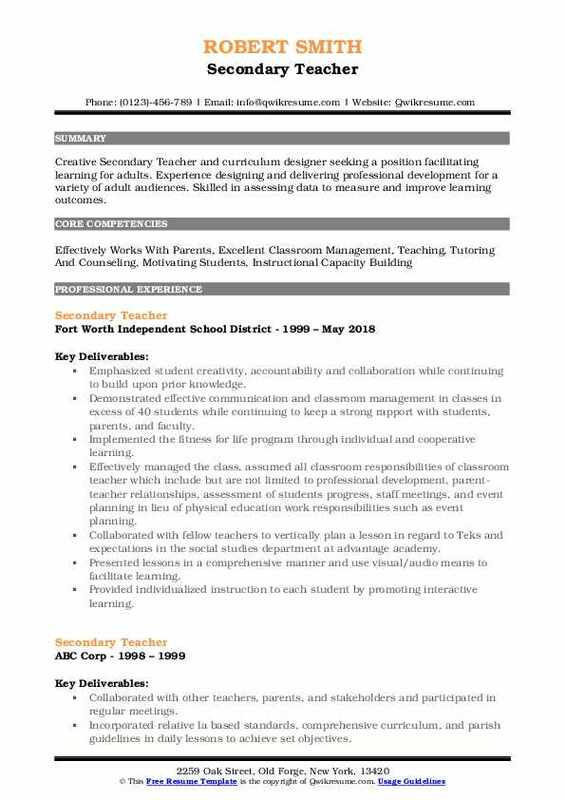 Summary : Creative Secondary Teacher and curriculum designer seeking a position facilitating learning for adults. Experience designing and delivering professional development for a variety of adult audiences. Skilled in assessing data to measure and improve learning outcomes. Emphasized student creativity, accountability and collaboration while continuing to build upon prior knowledge. Demonstrated effective communication and classroom management in classes in excess of 40 students while continuing to keep a strong rapport with students, parents, and faculty. Implemented the fitness for life program through individual and cooperative learning. 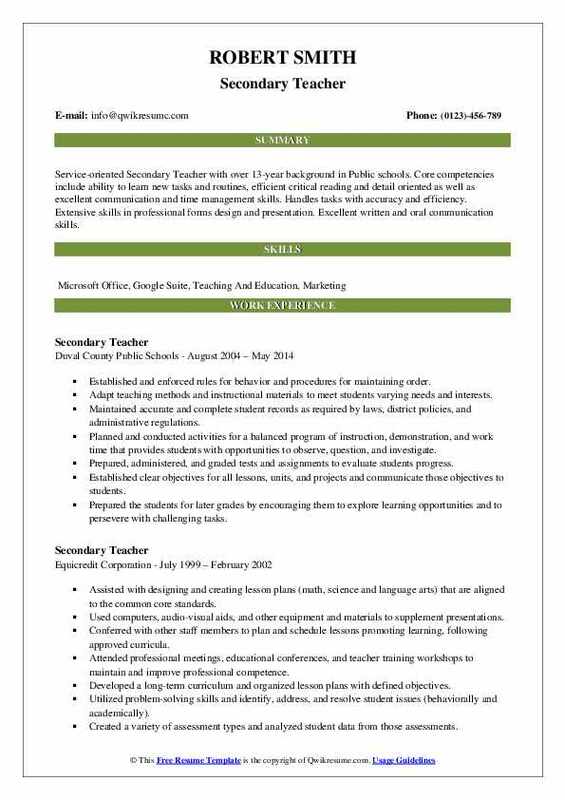 Effectively managed the class, assumed all classroom responsibilities of classroom teacher which include but are not limited to professional development, parent-teacher relationships, assessment of students progress, staff meetings, and event planning in lieu of physical education work responsibilities such as event planning. Collaborated with fellow teachers to vertically plan a lesson in regard to Teks and expectations in the social studies department at advantage academy. Presented lessons in a comprehensive manner and use visual/audio means to facilitate learning. Provided individualized instruction to each student by promoting interactive learning. Headline : Innovative Secondary Teacher with 5 years of classroom experience, who prides himself on creating engaging lessons that are relevant to my student's world. I have a passion for developing curriculum and then delivering that curriculum in a manner that is well-organized, interesting, and clear. Utilized various teaching strategies, which encouraged student participation. Coordinated and executed online broadcast of high school athletic events. Provided instruction to students by planning effectively for instruction, providing written lesson plans in the prescribed form, delivering instruction effectively, presenting the appropriate content, providing opportunities for student involvement in the learning process and assessing student progress effectively. Planned a daily program of instruction based on curriculum guides. Sent the interim reports at mid-report periods. Prepared laboratory experiences and developed and implemented curriculum objectives based on pupil assessments. Assigned homework to the student as aligned with the curriculum needs. Constructed and administered tests and other diagnostic material to identify individual levels of attainment. Summary : Secondary Teacher passionate to create an environment that promotes hands-on learning for children at all stages of the learning process. 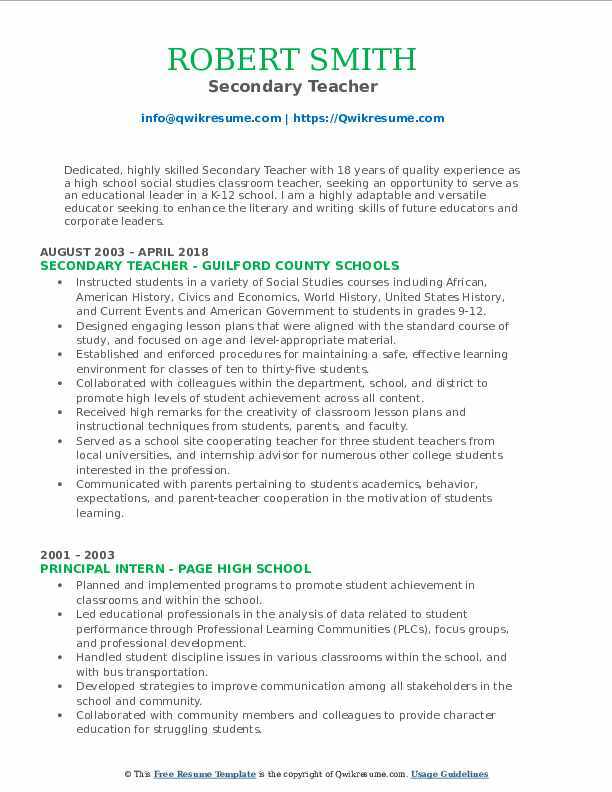 Self-directed, enthusiastic educator with a passionate commitment to student development and learning experience. Developing curriculum for and teaching for several different courses, including AP courses. Leading student mission trips across the U.S, including an international trip to Vancouver, British Columbia. Collaborating and cooperating with other educators on strategies for problem-solving, mathematical reasoning, and communication through the use of constructed response questions. Preparing and presenting lectures pertaining to major world religions, effects of human population increase and decline, geographical issues, and economics. Taught grades 6-12 in a variety of courses including journalism, computer technology, business marketing, keyboarding, graphic design. Providing one-on-one attention to students, while maintaining an overall focus on the entire group. Establishing positive rapport with all students and parents through home calls and conferences.